Three of my favorite perennials are in bloom in the garden. It is so refreshing to see the happy flower faces when I stroll around the house. I purchased the Cancun Asiatic lily from a lady who lives on a farm a few towns over. They looked spectacular planted in large masses in her overwhelmingly huge garden space. Since my space is limited, I only took one and it stands proudly above the rest, demanding attention from passersby. It is bi-colored magenta red with yellow centers. A prolific bloomer with up to 12 blooms per single bulb. The up-facing bloom is good for cut flowers. 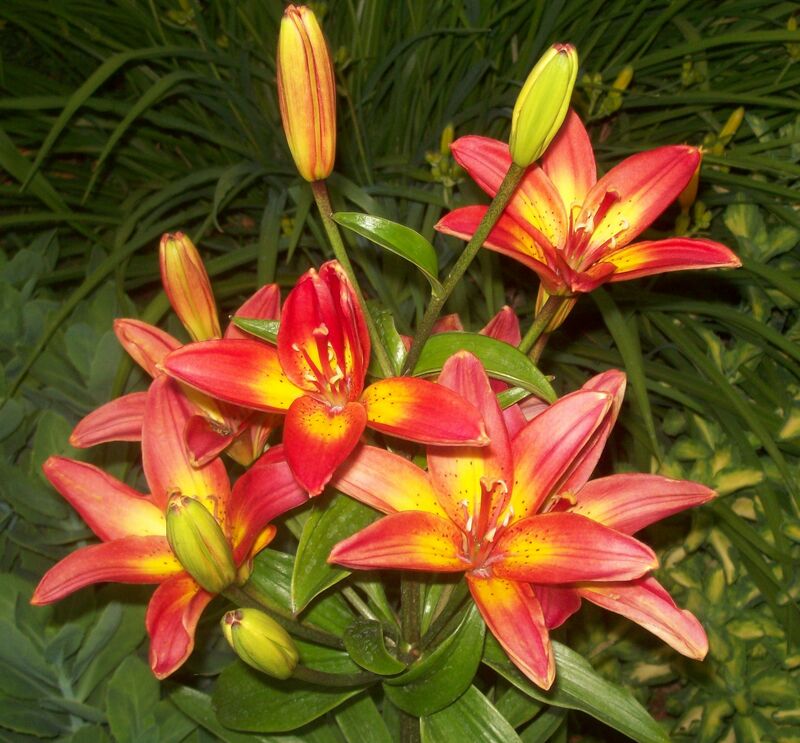 True lilies have stiff stems with relatively narrow strap like leaves from top to bottom. Large, showy flowers develop at the tip of each stem. I read that if you push a couple of sticks of chalk in beside the bulbs each spring, it is like a “timed-release” feed. You can also remove the orange center pistils to add bloom time. Another easy-care beautiful perennial is the Early Sunrise Coreopsis. This will continue to bloom all the way until first frost! This plant is drought tolerant and likes to have its spent flowers removed. 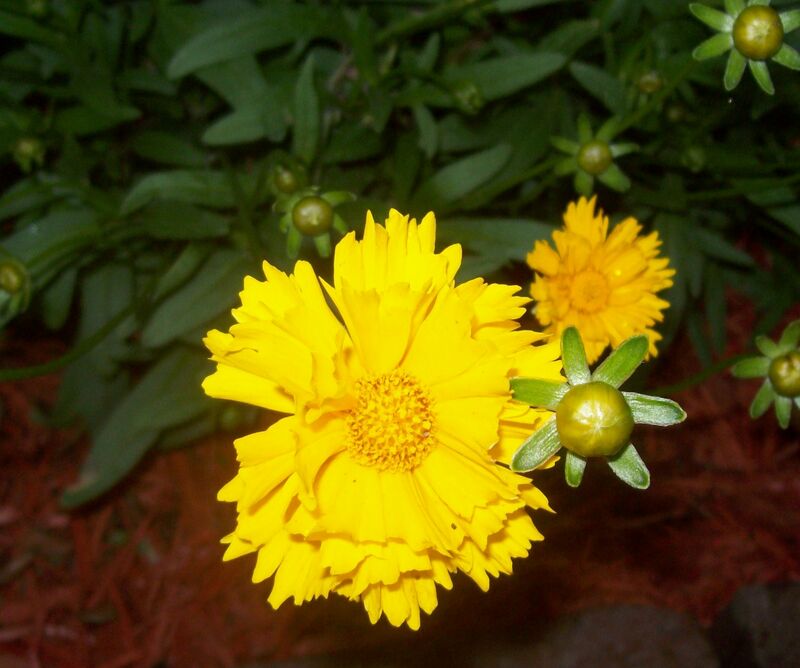 This plant has golden yellow, semi-double flowers on 20″ stems. It attracts lots of butterflies and I love the cheery and compact nature of this plant. While the last flower I am featuring here is sometimes considered common and mundane, I happen to adore it. It’s the Stella de Oro daylily. This plant is the easiest to care for (pretty much requires no attention at all! ), and it’s a reliable bloomer that will also continue until frost. I often see them planted at grocery stores, parks, and gas stations. The low maintenance and buttery blooms make it a key plant for filling in with long lasting color. 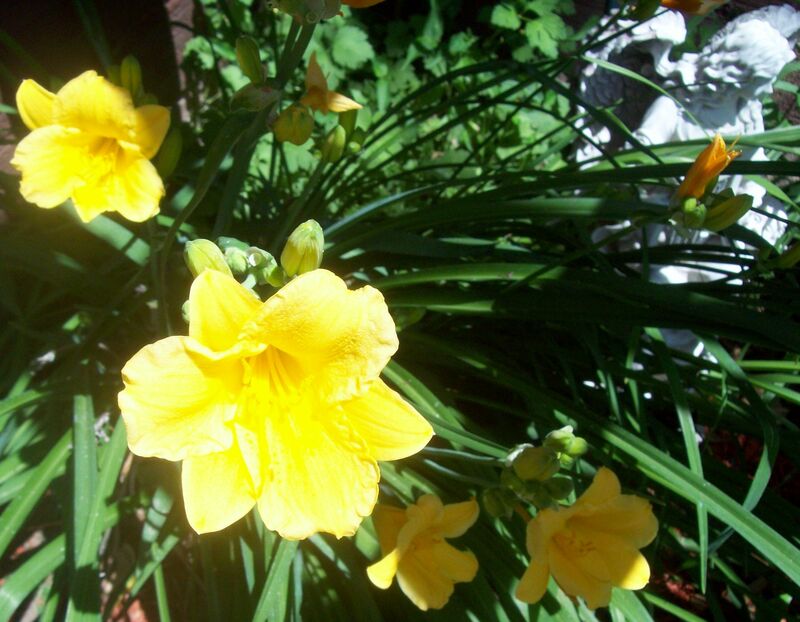 This daylily will grow in any type of soil so long as it is not water-logged. It will produce well in partial to full sun, but I have also witnessed it thriving in shady locations. What are your favorite perennials? Any suggestions for long bloomers in a shady location around a huge maple tree? Posted by Createityourself on June 4, 2012 in Plants and Gardening and tagged coreopsis, daylily, easy care perennials, flowers, gardening, lily, long blooming, perennials, Plants, stella de oro. I was not sure what surprise lillies looked like so I looked them up. They are awesome looking and I want some! Thanks for commenting! I have a few Cancun Asiatic lilies that I discovered in the yard of my new home! Same color and all. I new they were some type of lily, but I didn’t know what they were called. They’re breathtaking! Yes, they are breathtaking…I wish the blooms would last all summer. Thanks for commenting! Beautiful! I’m writing all of these down an checking my zone! Love perennials! Perennials are the best, especially the long bloomers! well i learned something new.thank you ! Thanks for the lily recommendations, I’ve been meaning to pick some up. I like the fact that the Cancun Asiatic lily has so many blooms. Shade-loving long-blooming perennials that have been successful for me are Columbine, Salvia, and Wishbone plants. The flowers on these plants are all small, which may accent the large lilies and Coreopsis you mention. Thanks for the suggestions…I will have to look up wishbone plants! I am really new to gardening, but bought a bunch of tulips to plant this Fall. I was trying to think of some ideas for hiding the tulips when they are done blooming, and day lilies seems to be a good choice. Pretty, easy to take care of = my kind of plant lol. I love easy plants too. Thanks for your comment! Oh sooooo pretty. Mine are a bit behind right now. Just a bit cold here after the warm winter. Wierd how that works. I enjoy all these here in my Zone 3 garden, and I cherish their toughness and beauty. As far as a long bloomer near a shady Maple… that’s tricky. I do enjoy Beebalm (Monarda), Purple Coneflower (Echinacea) and Salvia ‘May Night’ for their ability to survive in the bright sun and deep shade from sharing a yard with two huge Spruce. Filled in with Lamium, Lady’s Mantle and more. Thanks for another wonderful post.